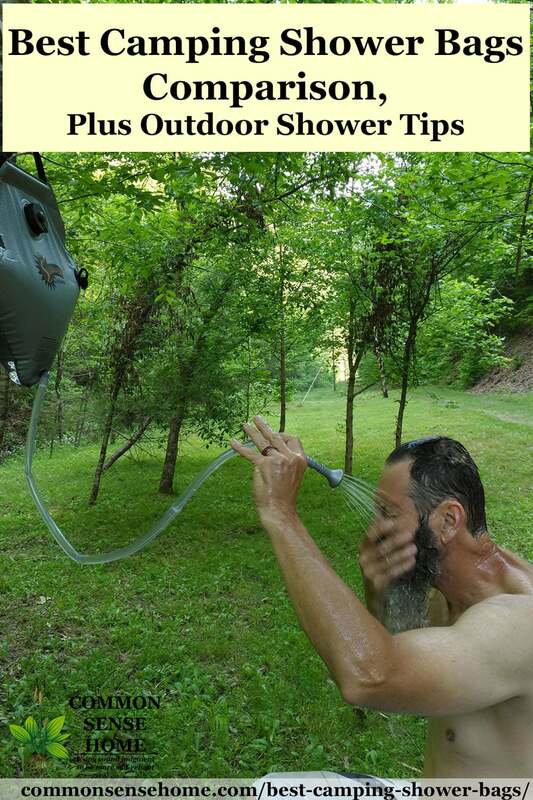 Have you ever gone camping and didn't have an outside shower available? Being hot, sticky, covered in bug spray and dirt is no fun when you crawl into a sleeping bag. We've moved to a remote cabin in the woods, and our current living situation is somewhat like glorified camping. No bathroom, no running water, and no bathhouse. The camping shower bags and our outdoor shower setup allows us to wash up outside and keep the whole family clean. They are a lifesaver! 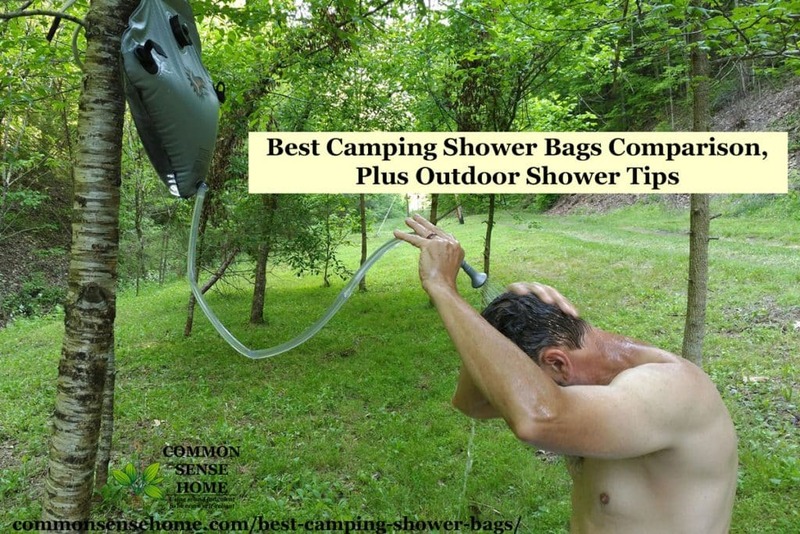 Camping Shower Bags – Do They Really Work? So, what is a camping shower bag you might ask? 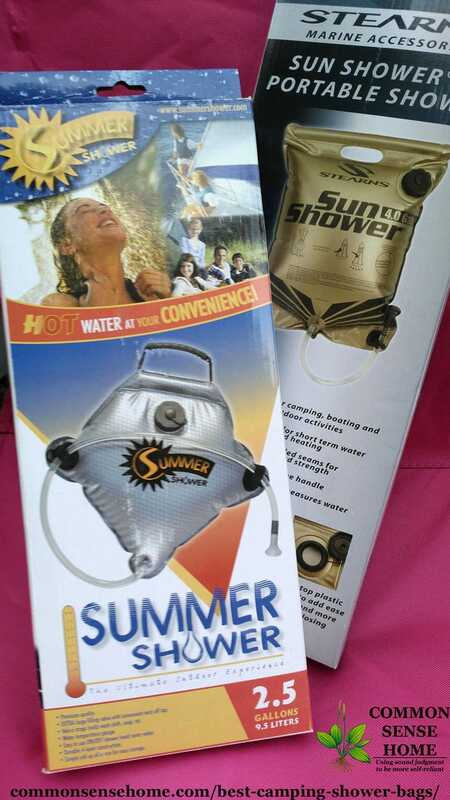 Basically, the solar shower/camping shower bags are a plastic bladder with a shower hose attached. You lay the shower bag in the sun to heat up the water, then hang it and stand under the bag to shower. Do they really work? The answer is, YES! They really work. 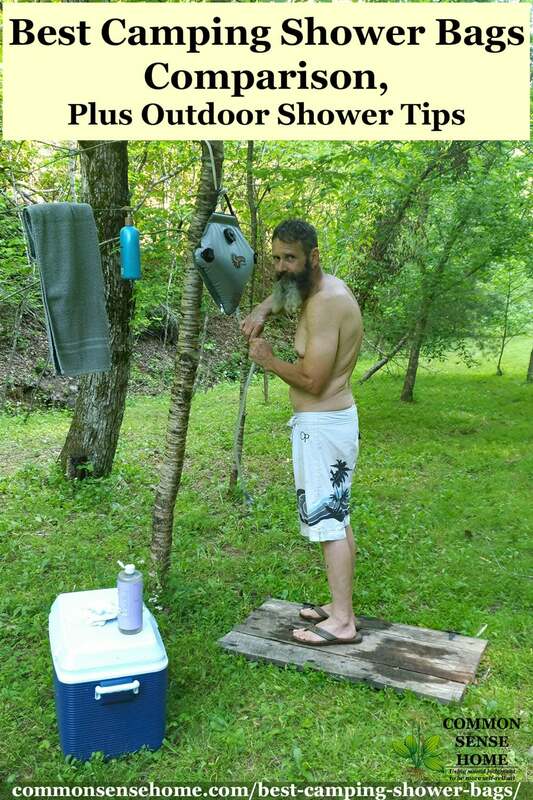 When we moved (mostly) off grid, our options were limited until we could build our home with a working shower. Thankfully, Laurie sent us the top two name-brand camping shower bags to try. I will share what we like (and don't like) about each one. But first, I would like to discuss other shower/bath ideas for camping. As I mentioned above, we moved to a remote cabin, but it feels more like camping. 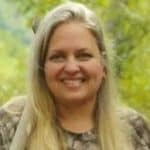 We cook out on a fire, gather our water from the creek, hang outside with the kids, toss the Frisbee, and don't worry about checking the clock all day. The five of us (ages 53 to 6 yrs. old) live in a tiny 500 sq ft log cabin. It's close quarters when we're all inside. Of course, it's all fun and games until one of us gets a little funky. Knowing our build would take months, we had to come up with plans A, B, and C for taking showers regularly. To be honest, we've done all four, but the 4th option is by far the best. The cowboy baths just didn't do a thorough job. The creek was freezing cold. However, on the upside, my teen daughter took a 3-minute bath as opposed to the 45-minute hot showers she used to take. We did join the local recreation center that has hot running showers, a pool, gym, and more, but a trip there takes us over 4 hours and that eats up our entire day. Not to mention, their hours of operation aren't always convenient. 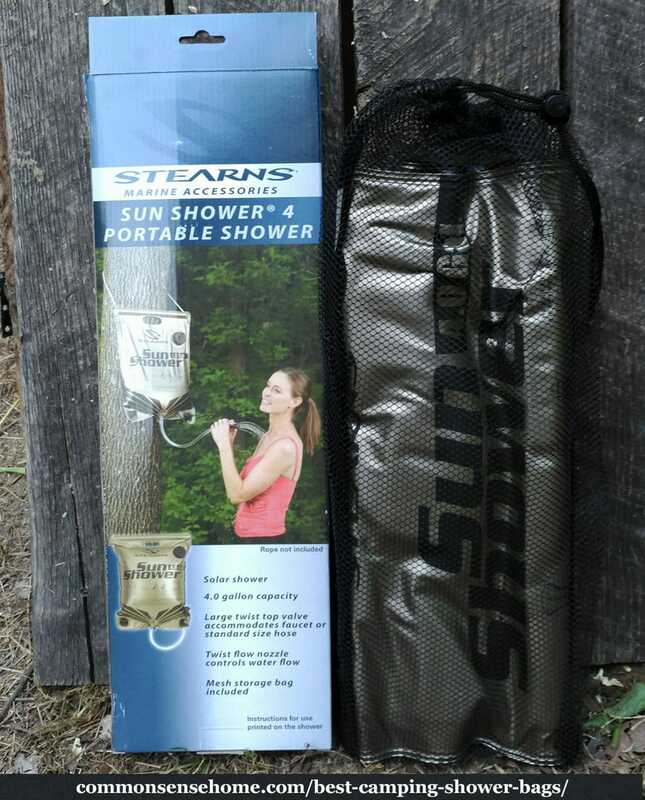 The Solar Shower Bag is easy to set up with no assembly required. As long as you have some sunshine, you can take a warm shower. If you don't have sunshine, you can still take a shower but it's a little chilly, unless you use another method to preheat the water before filling. I was surprised by how easy it was to use the solar shower bag. They came completely assembled and the instructions are printed on each bag. We laid them in the sunlight to warm the shower hose, as they were crimped from being in the package. The instructions tell you to rinse with warm water and baking soda before your first use. 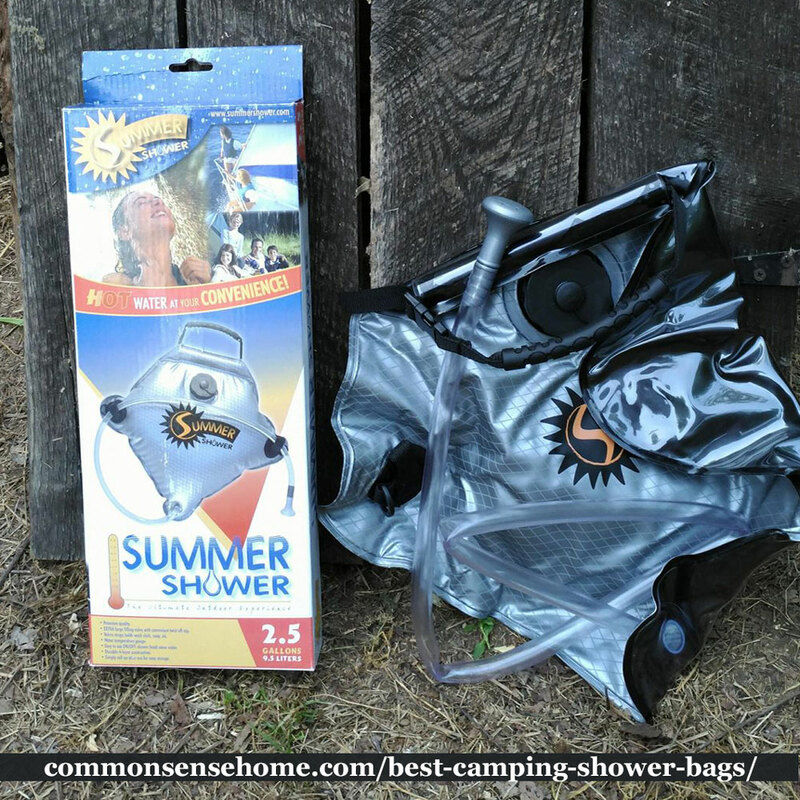 To use your camping shower bag, you fill it with water, close the cap, place it in the sun and wait a couple of hours. When you are ready to shower, use a strong rope to fasten the solar shower to a structure or tree to hang it above your head and you're ready to get your clean on. Turn the shower nozzle on, wet your hair and body. Turn the water off, do not let it run when you don't need it. Lather, wash and rinse. It's simple, quick and gets the job done. 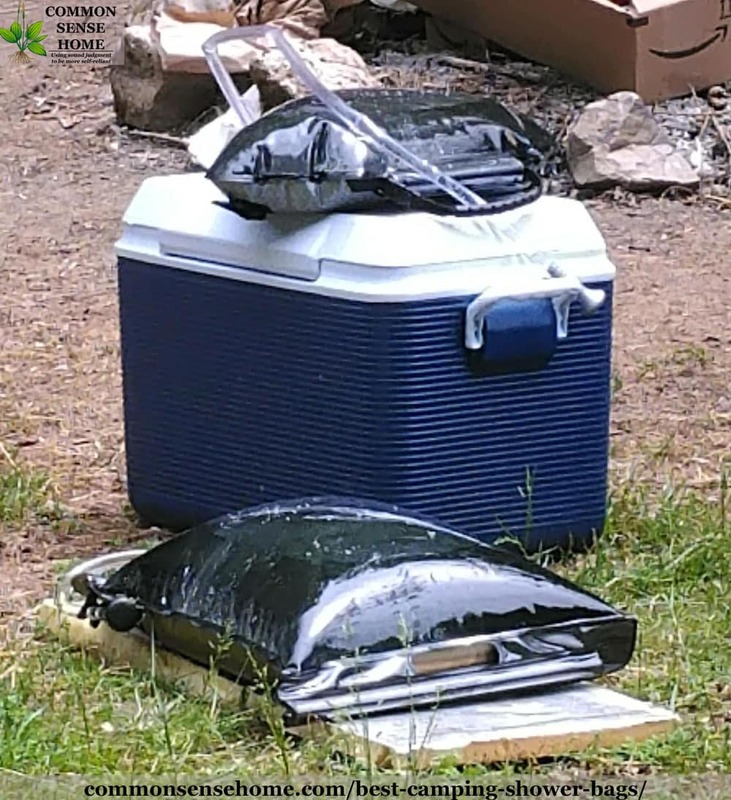 Camping Solar Showers are not your luxurious “wash all your stress away” kind of showers. They are more the “hurry up get the stink off and get out” kind of showers. Location, location, location. Location is everything in real estate and showers. Trust me. When we first moved to our property, it was the tail end of winter and none of the vegetation was growing. We placed our outdoor bathhouse by the creek under a nice tree so we could have privacy and hear the water flowing. Trust me when I say to pick your shower location wisely. It's good to set up a platform that allows water to drain away so you don't end up standing in mud. We also strung up a line next to the shower to hang shampoo, a towel and sometimes spare clothes. 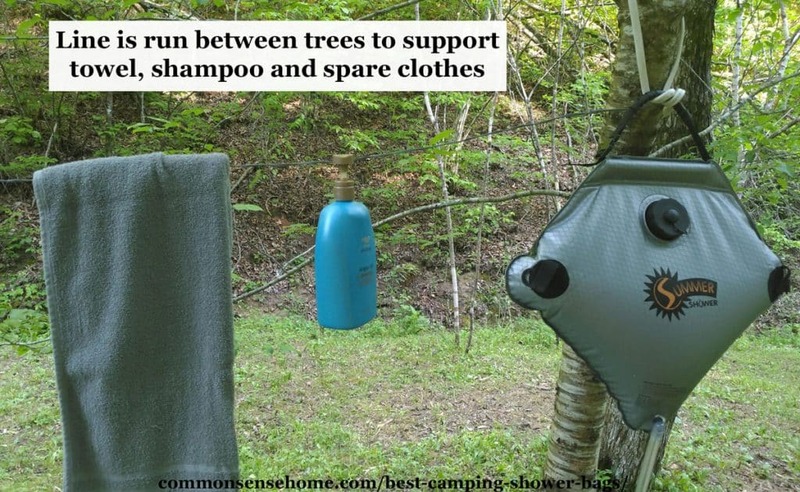 Where Can You Use a Camping Shower Bag? 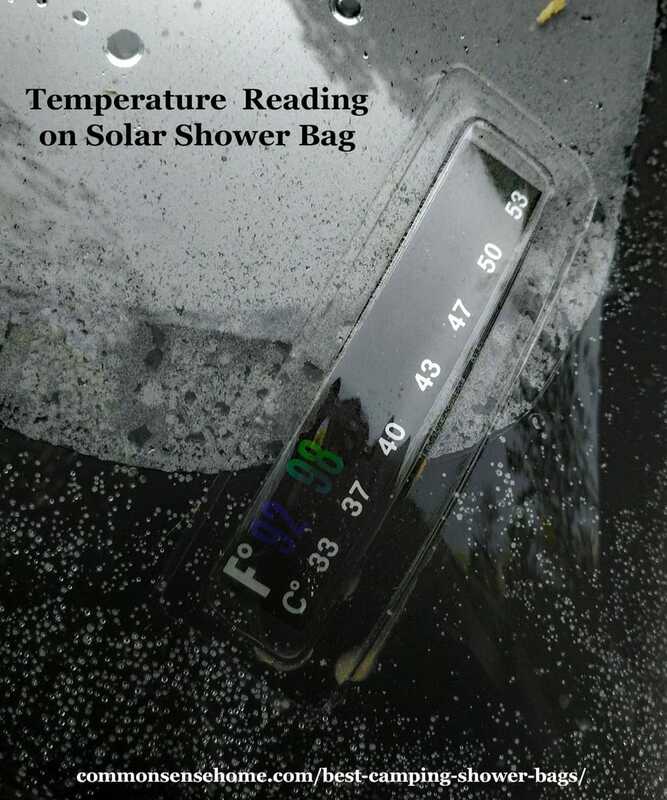 Two top-ranking solar shower bags are the Sun Shower and the Summer Shower. They are both great products and we had things about each of them that we enjoyed. We also had a couple of things we weren't ‘in-love” with. There are five of us using the camping shower bags, and we all reviewed both showers. The Summer Shower is the smaller of the two so I will share it first. Shower sprayer is easy to turn on and off. Pull the spray nozzle to run the shower and push to close the sprayer. Only holds enough water for one person to take a full shower. However, if you are just rinsing off, multiple people can use it. You have to either hang the shower really high (like use a ladder high) or sit on a bench when washing your hair because the water stops flowing if you raise the shower head above the bladder (shower bag). Can't control the flow of water. It's either on or off. You can control the water flow by turning the nozzle. Very heavy to hang, especially for one person. Water won't get hot if the sun isn't out. Takes a long time for the water to heat up. Which Solar Shower do we Like Best? In all honesty, we love both equally, but if you made me pick just one, it would have to be the Summer Shower. The Sun Shower is too heavy when filled for me to lift by myself. I would hate to not be able to shower simply because I couldn't lift the bag. I would highly recommend either bag for any camping/outdoor enthusiast, or for you to add to your B.O.B. It makes a great addition to any preparedness bag. In all honesty, I do have two of the Sun Showers (I think…they are packed away with all of my camping stuff). However, I am a bit hesitant to use, as I wonder about the BPA from plastics…it will be going directly onto warm wet skin, thus making it easier to be absorbed into the body. Anyone have any thoughts on BPA exposure using these? Otherwise, great post, and lots of useful information based on your personal use of these! Thanks! Even though it’s possible some BPA may be absorbed from the bag, the water isn’t in contact with the bag for month or years, like food may be in contact with a can liner. Also, the water is in contact with your skin only for a short amount of time, so I would anticipate that exposure risk is fairly low, although I could not find any information on it while searching online. Like the review. Question? Why not hang a pulley in tree or upward location string up your non rot rope with a hook on the end then load your shower bag on the hook and hoist to desired height.